I’m a work in progress, but I was asked by Jesus and my spirit to write the messages and questions of this book. In the new book, “Just Be Love,” author David Schroeder guides readers to a vast understanding of love through reflection and exploration. This book inspires readers to be open and honest about how they’ve learned to love and be loved. It looks at some of the barriers many have created toward self-love, as well as giving and receiving love with others. 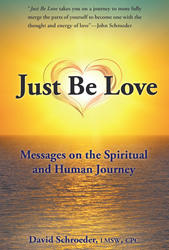 “Just Be Love” is designed to open hearts and expand minds toward higher awareness and deeper love. Schroeder’s mission is to teach readers that the answers to their many questions about life and love are found within themselves. He believes it is one’s birthright and soul’s journey to explore and answer these questions that have for so long been hidden deep inside. Schroeder hopes his book inspires readers and participants to create higher possibilities and opportunities with love. His desire is that the book serves as an advocate for readers to tap into the higher and wiser part of themselves to answer and live life changing questions. David Schroeder, LMSW, CPC, is a life coach and clinical and spiritual social worker. Through workshops and retreats, Schroeder offers a variety of techniques to assist individuals, couples, and groups in finding healthy pathways to love, higher awareness, and greater potential. Schroeder lives in Grand Rapids Michigan with his loving wife Terese. He values helping others, time with family and friends, walks in nature, meditation, traveling, and connection with Source.